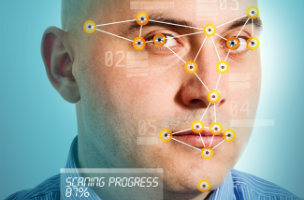 Facebook working on facial-recognition software. Pandora increases price of premium subscription. These stories, and more, in today's Morning Social Media Newsfeed. An accuracy rate of 97.25 percent is fairly impressive in most cases, and when it comes to facial recognition, DeepFace, a facial-verification software project being developed by Facebook, reached that level, according to a research paper released by the social network last week, which added that human beings shown two unfamiliar photos of faces were able to identify whether or not the subjects were the same person 97.53 percent of the time, barely edging out DeepFace. MIT Technology Review pointed out that the progress made by DeepFace marks “a significant advance” over previous facial-recognition software, adding that DeepFace has received a boost from Facebook’s emphasis on artificial intelligence. Forbes As a comparison, humans generally have an average of 97.53 percent accuracy. This means that Facebook’s facial-processing software has nearly the same accuracy as humans. The Huffington Post As an example, the developers show in a paper on the program that DeepFace can successfully recognize Academy Award winner Sylvester Stallone. There’s another example of the program recognizing who we think is Calista Flockhart (a.k.a. “Ally McBeal”). MIT Technology Review DeepFace processes images of faces in two steps. First it corrects the angle of a face so that the person in the picture faces forward, using a 3-D model of an “average” forward-looking face. Then the deep learning comes in as a simulated neural network works out a numerical description of the reoriented face. If DeepFace comes up with similar enough descriptions from two different images, it decides they must show the same face. GigaOM Deep learning is currently an area of investment for a number of web companies ranging from Pinterest to Netflix, although Facebook and Google have probably made the biggest news with their high-profile hires and acquisitions. It’s such a hot field because deep learning techniques are proving very effective at recognizing objects within images and analyzing language — two things that many web companies have by the petabyte — without much human supervision. Pandora is making a few changes to its premium streaming music service — most notably a fee hike for new monthly subscribers. The company announced Tuesday that because of rising royalty rates it pays to musicians, it’s having to up its monthly fee for the first time since Pandora One debuted in 2009. Starting in May, new members will have to pay $4.99 per month rather than the current rate of $3.99 per month. Both platforms have made short-form video a viable resource and important engagement medium for marketers — with a maximum of six seconds on Vine and 15 seconds on Instagram. A recent three-month analysis by Socialbakers found that while consumers often share Vine videos, it has proven highly unsuccessful for marketers. Clearly, there’s a reason people unsubscribe from your newsletter: Maybe they don’t think you’re creating great enough free content or are fed up with your shameless self promotion. Maybe you’re just sending too much? In just five minutes a day, you can drastically improve the number of Twitter users you reach. By paying attention to the trends, you can incorporate keywords and hashtags that will get your tweets in front of more eyeballs than just your followers.